The £1.2bn extension linking Kennington to Battersea is due to be completed in 2020. Two machines the length of football pitches which will create the first major Tube line extension since the 90's will be unveiled today. It is a significant milestone in the expansion of the Northern line that is set to create 24,000 new jobs and 18,000 new homes in Vauxhall, Nine Elms and Battersea. A planned extension of the Northern Line to Battersea via Nine Elms has been given the go-ahead by the government today. Transport Secretary Patrick McLoughlin approved the new development - which will create two new stations, one at Battersea Power Station and another at Nine Elms. The extension is expected to cost up to £1bn - but TfL say it will be funded by contributions from new developments as part of the area's regeneration. The new line could be open by 2020 and should cut journey times into the City and the West End down to around 15 minutes. 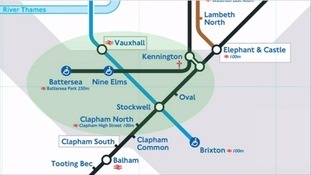 The £1 billion extension to the Northern Line to Battersea has been given the go-ahead by the Government. The extension will create two new tube stops in Battersea - one near Wandsworth Road and another next to Battersea Power Station. It forms wider plans to regenerate Vauxhall and Battersea that also sees news homes and commercial buildings being proposed along the riverfront as well as the new American embassy being built in the area. After years of campaigning, South Londoners are getting the tube extension they've been hoping for. The Government is expected to announce that a one billion pound extension to the Northern Line has been given the go-ahead today. The Northern Line Extension will create two new tube stops in Battersea: one near Wandsworth Road and another next to Battersea Power Station. Commuters in south London say they're furious with TfL after being asked to avoid part of the Northern Line during rush hour, because it's too busy. In a pilot project, Transport for London is offering advice on alternative routes, or suggesting that people walk or cycle to avoid the busy stretch between Tooting Bec and Clapham North while improvement works are carried out. Our Political Correspondent Simon Harris reports. ITV London has been at Clapham South station to see what you thought about TfL asking people to walk or use a different station to avoid overcrowding. The reaction has been mixed, with some saying it's unfair on people who can't change their journeys while others are happy to try anything that might lessen the crowds. What do you think? Tweet us @itvlondon or write on our Facebook page at facebook.com/itvlondon. "During the 2012 Games many of our passengers made small changes to their journeys which meant we were able to carry record numbers without the transport network feeling any busier. "This section of the Northern Line is exceptionally busy during part of the morning and while the modernisation of the line will help to relieve crowding when complete next year this trial will look at whether we can improve the situation now. "By making a small change to the time they travel our passengers' journeys could be faster and more comfortable." "Transportcosts are going up and up while salaries stay flat - so it is frustrating whenthe service you're paying for isn't the service you're being recommended touse,"